Happy Anniversary Fiesta Friday! I hope you all had fun last week with cocktails and nibbles while I ate my burned curry… As an extra special treat I decided to make a recipe that I already knew I liked. I’ve never cooked this before, my lover has always cooked it instead and he was keen to see how the recipes compared. 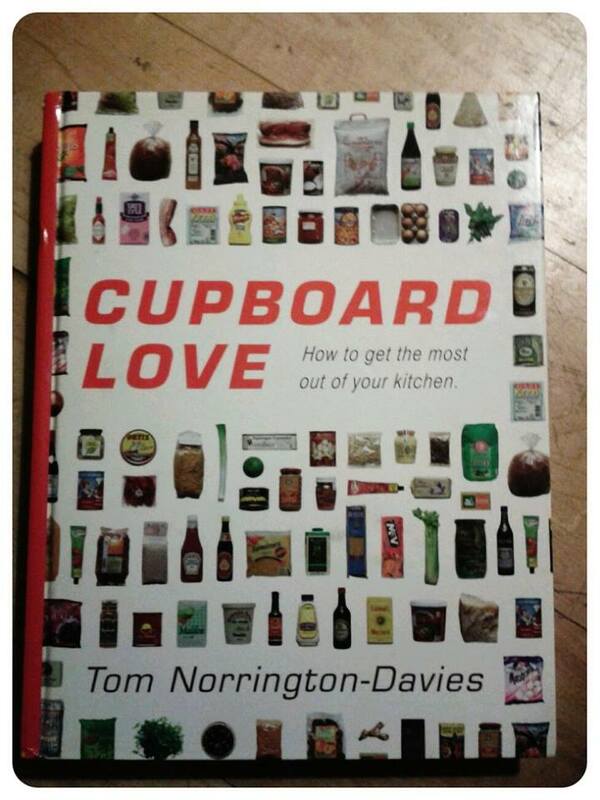 Until I started doing new recipe night this was one of only two recipes in the Cupboard Love book that we’d tried, and I’m not allowed to do the risotto again! To make this for 2 you will need: 2 tablespoons vegetable oil, 6 chicken thighs (or equivalent weight in chicken breast, duck or pork), 1 tbs of green Thai curry paste, a 400ml tin of coconut milk, 1tbs Thai fish sauce, half tsp sugar, juice of half a lime (or 1tbs lime juice from a bottle), 3 lime leaves (or grate the zest of 1 lime), a 200g tin of bamboo shoots (drained), 3 spring onions sliced diagonally to look fancy, and some Thai basil or coriander leaves to garnish. I also had to add a 200g tin of water chestnuts on my lovers insistence, but it bulks it out quite a lot and makes the recipe easily feed 3. When my lover makes this he leaves the chicken thighs whole, but I decided to cut them into strips instead. Also, its hard to wrestle a cooked thigh into pieces when you’re eating on your knees! Heat the oil in your trusty wok and then add the meat, brown it all over then remove it and set it aside. Add the curry paste to the wok with a couple of tablespoons of coconut milk. Stir it up until it has formed a loose sauce-y paste. 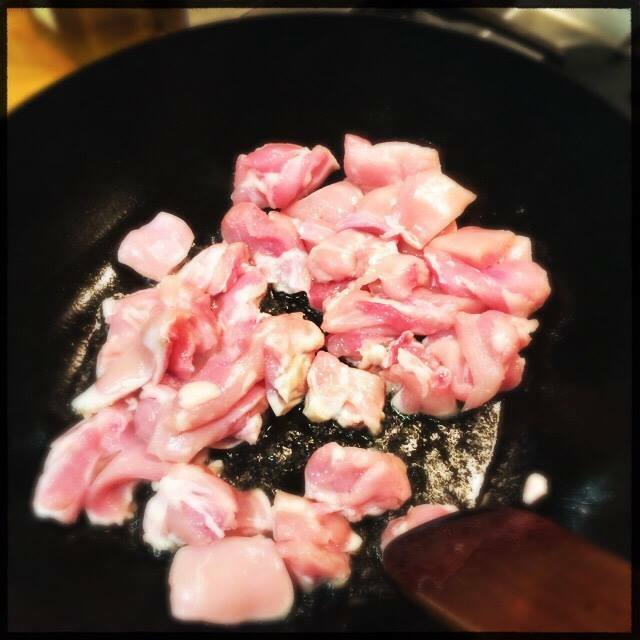 Put the chicken back into the wok, with the fish sauce, lime juice, sugar and lime leaves/zest. Pour in the rest of the coconut milk, then half fill the tin with water and pour that into the wok too. Simmer for 20 minutes (ish) until the the chicken is cooked. 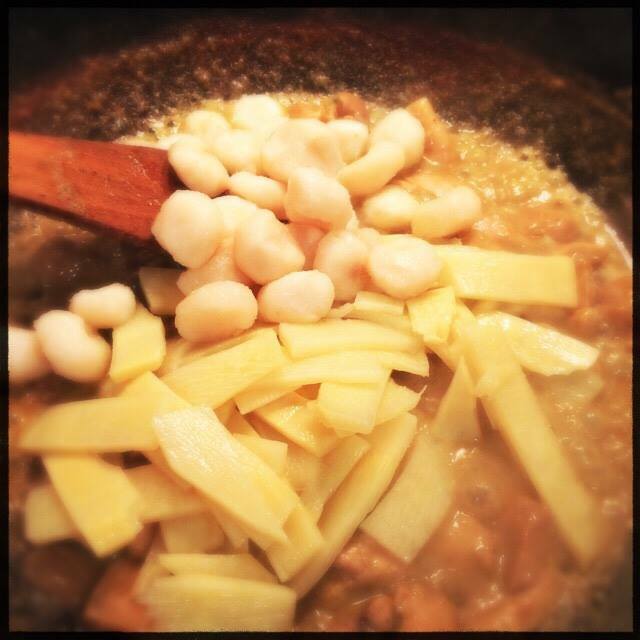 Add the water chestnuts, then a few minutes later the bamboo shoots and cook until they’re heated through. 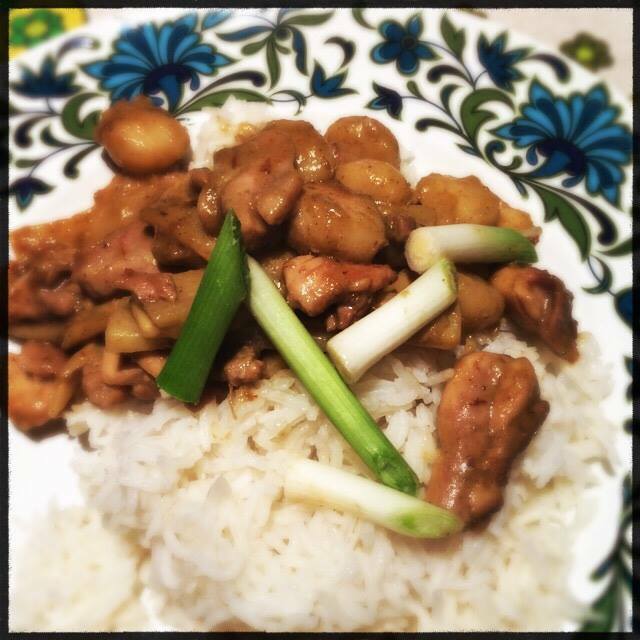 Artfully scatter the spring onion pieces over the top and serve with rice. 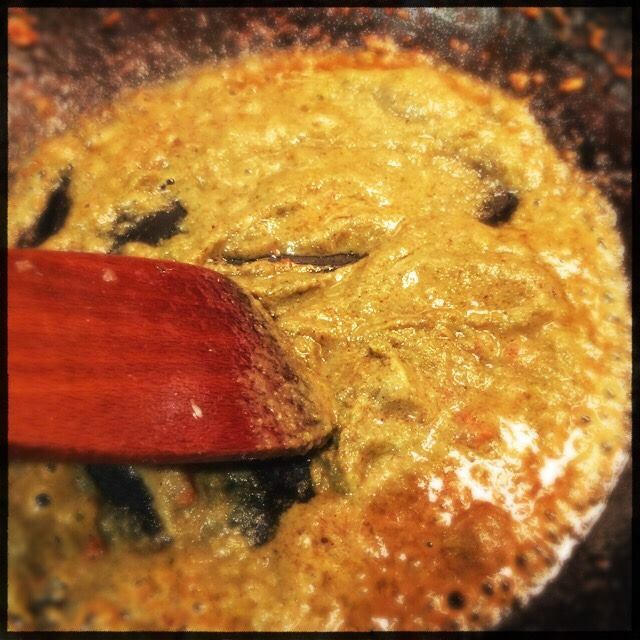 I didn’t go as generous with the Thai green curry paste as my lover but it still blew my head off, I get quite a strong one from the Thai Supermarket, but it still came out hotter than when I use it in Nigela’s beany curry. We’re not sure if it was better when my lover made it or I did; but it’s such a good recipe it was just as good irrespective of who cooked. Now I know I can make it too there’s no stopping me! Wow! This looks amazing, Simon. I am sure everybody would love this dish of yours. I am getting myself a plate. 😀 Happy FF! 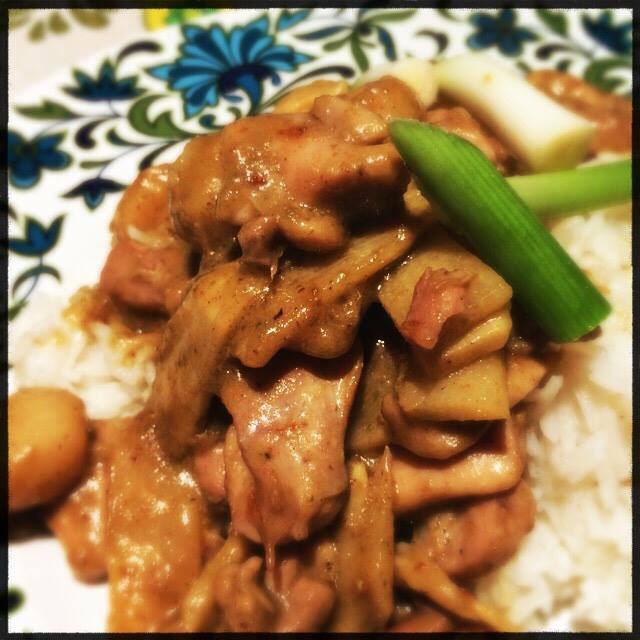 Based on the photos you’ve provided with this post, I do believe you nailed the Chicken & Green Curry recipe! It looks fabulous…and it sounds delicious too. 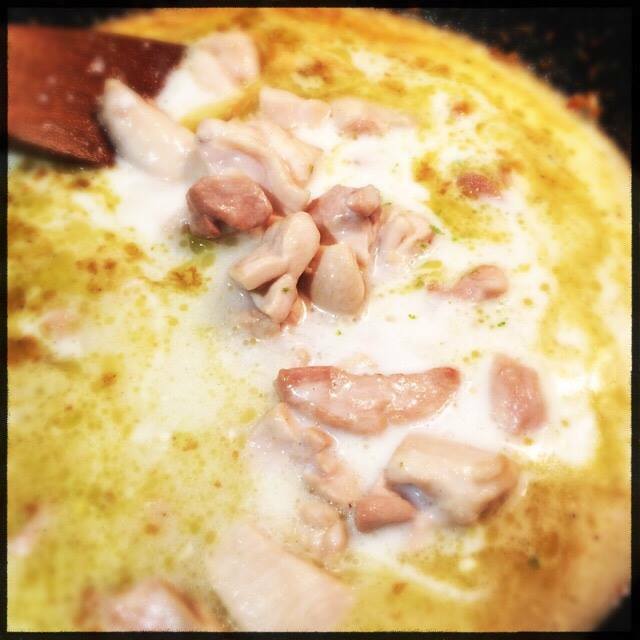 But now you have me wondering why you’re not allowed to make risotto again… you obviously CAN cook, and cook well. 🙂 Thanks for sharing your delicious triumph with all of at the Fiesta Friday Block Party! Oooh my mouth is watering over this curry, it looks delicious! Saucy chicken thighs! Looks delicious- perfect. Happy FF!